Are You Ready for the Summer Recruiting Cycle? It’s that time again…summer club season. 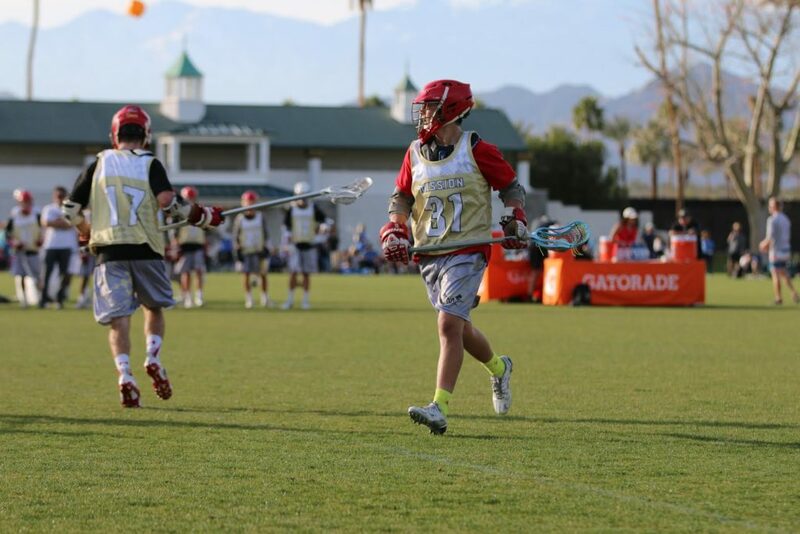 By this point in the year, most high school lacrosse players have sifted through the multiple club teams, showcases, prospect days, and tournaments to which they have been invited, and tough decisions are being made. Likewise, college coaches are finalizing their plans, allocating precious recruiting resources to various tournaments and events throughout the country. In this installment of our College Game Plan Education series, we’ll provide a basic overview to get the most out of your summer investment. Have you narrowed the list of schools that you’re interested in? There are over 350 colleges with NCAA Men’s Lacrosse programs, but only a few schools that align with your academic, athletic, social, geographical, and financial goals. Taking the time up front to focus only on best-fit schools will save you and your family tremendous amounts of time, money, and frustration. We call this developing a “target list” of schools. Factors such as what academic programs are offered (and their rating), school size, location, social aspects, level and culture of the lacrosse program, and the coaching staff must be considered to make an informed final decision and should be part of developing your target list. What coaches from your target list committed to attend your events? The questions I most hear from families in late spring revolve around one topic: the BEST teams/camps/showcases to attend this summer to be seen by college coaches. The answer to “which is best?” comes down to how many of your targeted schools will be at an event and whether you can interest them enough to come see you play. For example, a showcase heavily attended by Ivy League schools would likely not be the best use of resources for a player with a 2.5 GPA. If you have the grades, the desire, and the talent to attend Harvard or Princeton, however, it would likely be a great event to attend. Have you contacted any coaches to let them know where you’ll be playing? Many players believe that if they’re on the right team or at the biggest showcase, they’ll simply get noticed. NCAA rules limit the amount and type of contact a coach can have with an underclassman (currently 2018 and below), so you can’t expect to have meaningful conversations with them when you see them or meet them in person at events. While accolades like all-star teams and all-tournament teams on your resume can certainly have an impact, a college coach usually arrives at an event with a list of names they’ll be evaluating and those players’ schedules, so it’s important to make personal contact and begin to establish relationships with coaches in the weeks leading up to your events. Do you have an effective online presence? Lacrosse is quickly growing into a nation-wide sport, with more and more new players picking up a stick each year. College coaches are flooded with emails and phone calls from high school players that desperately want to attend their school and be a contributor in their program. It’s wise to make it as easy as possible for a coach to evaluate your potential as a recruited player rather quickly. In today’s recruiting landscape, a highlight video, your academic information, and your measurable statistics (height, weight, speed, etc.) are a bare minimum. It is a good idea to also include references and their contact information, your upcoming schedule, a copy of your transcript, and even a personal statement or a list of college goals you’re looking to achieve. Your goal is to establish a relationship with these coaches, so the more you set yourself apart during the initial evaluation phase, the more likely you’ll be recruited by multiple coaches and programs. The common thread in everything we do in the recruiting space is that it’s all about relationships. Choosing a college is an extremely personal and emotional decision for every family, and the investment is likely the largest any parent makes in their child’s future. As such, every player and parent feel the need to be personally comfortable with the school, the campus, and the lacrosse program before committing to attend. Likewise, college coaches earn their living based on how their team performs on and off the field, and the stakes are high, so they have to truly get to know the young men they invite to play for their program. Developing relationships with college coaches should be one of the main goals of your summer, and will require you to formulate a plan to make the best use of your summer lacrosse schedule and the opportunities you will have to be seen and evaluated by your best-fit programs. Are College Coaches Really Recruiting You? When a student-athlete becomes serious about playing their sport in college, it helps to understand when a college coach is truly recruiting them. Many families have difficulty interpreting the various types of correspondence from college coaches. They just can’t tell the difference when a coach is genuinely interested in developing a relationship versus one who is just marketing their school’s sports program. Understanding this difference is not only vital to your success, it saves you valuable time, money and resources on chasing opportunities that will never be realized. When your efforts are focused on the coaches and schools that really have an interest in you, the results tend to reflect more offers, higher scholarship amounts and a shorter recruiting cycle. At SportsForce, we like to help our families visualize this process. The diagram below shows a person climbing a mountain. This represents your son or daughter. They’re ascending the college recruiting mountain with possibly several hundred thousand other student-athletes also competing for a college roster spot for their particular sport. But on average, only about 5-6% of those few hundred thousand make it to the top of the mountain with an offer or scholarship. The areas listed on the right are the basic steps and communication that takes place along the way. More specifically, the areas in red are what we call “Base Camp One” on the mountain. That’s where a lot of student-athletes stop in terms of their college recruiting. At this point, they have no contact with college coaches. Another key indicator of being at Base Camp One is they might attend or be invited to a big tournament, combine or camp. They might also receive generic emails, questionnaires or form mailings from a coach. But that’s about as far as it goes. The red color means they have not advanced their recruiting progress. The key to knowing when you’re being “actively” recruited, is when your son or daughter have an ongoing personal dialog with a college coach. The area in yellow highlights some of these types of activities and communication. If they’re receiving personal texts, phone calls, emails or hand-written notes, this means they’re being actively recruited. If they are invited for an unofficial visit or Junior Day event, this also aligns with active recruitment. The yellow color means caution. Just because your student-athlete is actively communicating with college coaches does not automatically mean they will receive a written offer from them. College coaches are also pursuing other players, not just your son or daughter. Once in the green area, student-athletes (if they have not already) may begin receiving verbal offers. Those may lead to further official visits, which may produce written offers and ultimately a signed National Letter of intent. The green color means go and your student-athlete is receiving offers and probably achieving their college recruiting goals. 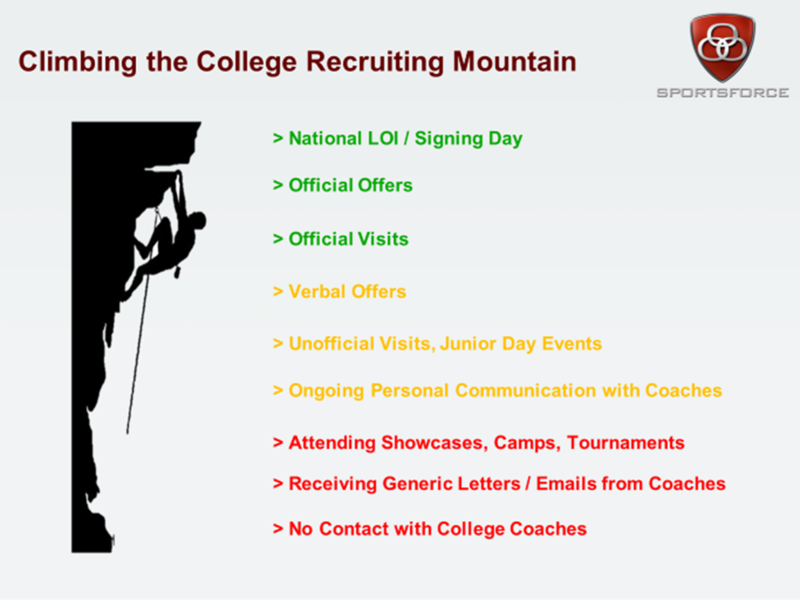 Where is your son or daughter on the college recruiting mountain? Do they need assistance in building personal relationships with college coaches or deciphering their communication? Contact us today for a personal college recruiting evaluation. Our highly trained team of college recruiting advisors have either played or coached their sport at the college level. Our entire team of professionals dedicates their passion, time and attention to properly evaluating, educating and successfully guiding qualified student-athletes and their families through the college planning and recruiting process.